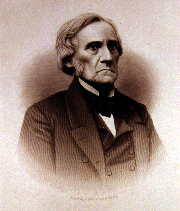 Throughout most of William D. Woodbridge’s life, he was involved in the development of Michigan. He was born in Norwich, Connecticut, on August 20, 1780, and attended Tapping Reeve’s Academy, which was the first law school in America. Once on his own, he began his family and career in Marietta, Ohio. Woodbridge soon found himself becoming involved in politics. He served in both legislative houses for the State of Ohio and also as the Prosecuting Attorney for his county. Woodbridge came to Michigan upon his appointment by President James Madison as the Secretary of the Territory under Governor Lewis Cass. While Secretary of the Territory, Woodbridge had a number of duties. At this point in time, Woodbridge took on another position, as he was elected to the U.S. Congress as a delegate from the Territory of Michigan. However, double duties proved to be too much for him and he returned home to devote himself to the work as the Secretary. In 1828, Woodbridge was appointed by President John Quincy Adams to the Supreme Court of the Territory to replace James Witherell. However, when his term as the eighth Territorial Justice expired in 1832, President Andrew Jackson did not reappoint him to the position. Yet, Woodbridge continued to influence the formation of the state. In 1835, he was involved in the convention that formed the Constitution for the State; by 1838, he was elected to the State Senate. By 1840, Woodbridge was elected Governor but only served for one year because he was elected to the United States Senate in 1841.